Choosing a song to cover is an art. Golden Bloom’s Shawn Fogel is quite adept at it, as shown by his choice of Wussy’s “Magic Words,” a track from the Cincinnati quartet’s celebrated self-titled album. “Magic Words,” a mid-tempo rocker, and his favorite, is transformed lovingly by Fogel into a poppier version of itself. Still present are the droning guitars, but added are the shiny synth touches that are a Golden Bloom trademark. All of this adds up to a unique approach to Wussy’s well-crafted phrases and lyrics. “I heard a lot of possibilities in my head, different directions I could take the song, says Fogel. “I ended up trying to inject a little more power into the pop and had a lot of fun reinterpreting this song in the studio.” Fogel is not alone in the desire to reimagine Wussy. This Will Not End Well, a remix album that was digitally released in September, is filled with tracks from Wussy, but does not include “Magic Words”. Shawn Fogel is no stranger to the art of the cover. This past summer and at CMJ 2010, he and members of Golden Bloom and The Motion Sick embarked on the ambitious task of playing Neutral Uke Hotel’s In the Aeroplane Over The Sea live on ukulele, melodica and trumpet as Neutral Uke Hotel. The shows were well received, filling venues with fans singing, clapping and stomping along to the beloved album. Fogel is back in the studio with Peter Katis (Frightened Rabbit, The National, Interpol and Tokyo Police Club), to produce some tracks on the follow up to Fan the Flames, which was compared favorably to Summerteeth-era Wilco, The New Pornographers, and Big Star and loved by critics and fans alike. 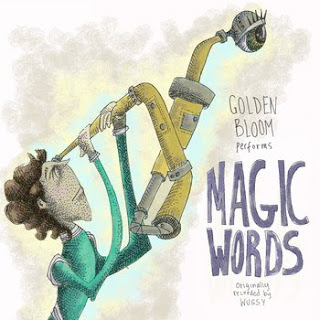 Download the “Magic Words” MP3!